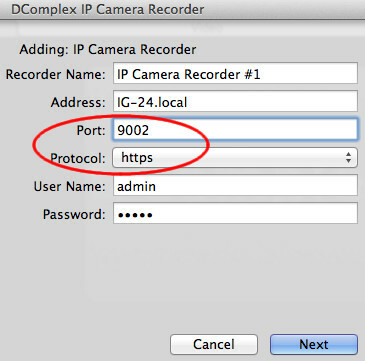 How to control IP Camera Recorder remotely from another Mac? There are two easy ways to control the IP Camera Recorder remotelly from another Mac. 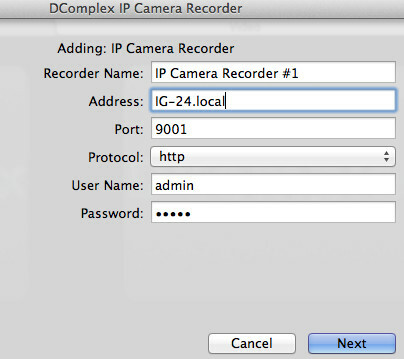 In any case, first you need to know the address of your Mac that runs the IP Camera Recorder. 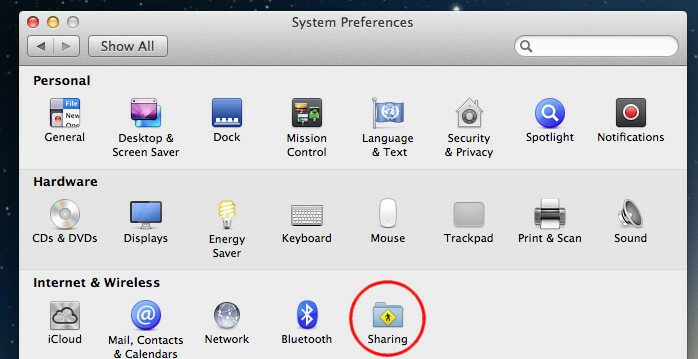 To find the address, open the Mac's System Preferences app and find the Sharing item. It is shown below in the red circle. If you just want to quickly see video from the recorder of quickly adjust it settings without installing any software on your remote Mac, you can access the Recorder from a web Browser (Safari). For this, enter the following address in Safari: http://IG-24.local:9001 . Note the address IG-24.local is the one that is shown above in the Sharing screenshot. Your address will be different. Enter your address instead of IG-24.local. The same way you cna also access the Recorder remotelly from any other computer, such as PC or an Android phone and etc. If you plan to access the Recorder remotelly from another Mac multiple times, we recommend you to install remote client app from http://dcomplex.com/macclient.pkg on the client Mac. In the app select menu item: Cameras -> Connect to an IP Camera Recorder and enter the address IG-24.local for this example. In your case, enter your address instead of IG-24.local. Or, select the following configuration to connect to the Recorder securelly (using the HTTPS protocol). Note: set the protocol to HTTPS and the port 9002 to use the secure connection, as shown in the red ellipse.